The Dolomites are a mountain range located in north-eastern Italy. A tourist mecca, the Dolomites are famous for skiing in the winter months, mountain climbing, hiking and climbing in the summer. convenient, efficient public transport. Buses & trains run on time. Best strategy for hikers in this region, we feel, is to day hike. Or do short 2-3 day itineraries. The longer routes (Alta Vie) are good. But you can get more gorgeous territory covered in fewer days with short hikes in different parts of the mountain range. weird karstification: rock surface channelling, sink holes, etc. vivid reminders of WW I history: bunkers, tunnels, barbed wired. no need to have a personal vehicle. Buses run to most trailheads. Oddly, no tenting is allowed. Overnight, instead, at impressive high altitude Refuge builidings. (Rifugios, in Italian.) Food and lodging can cost US$60 / day and up. A cheaper alternative might be to day hike from base towns in the region. Actually, prices at Refugios are normally regulated. Their food and drink tastes GREAT on a deck overlooking some of the finest mountain vistas in the world! you need your own “sleeping bag” for hygiene at the Refuges. Normally that’s simply a silk or cloth sleeping bag liner. expensive trail maps recommended. (Tabacco series.) Even though routes are well marked, sooner or later everyone gets lost in the Dolomites. guidebook is essential for deciding on what refuges to book by phone. It’s risky to decide on accommodation, as you hike. There is no central website or booking office. some routes are dependent on Refuges being open, buses running to trailheads. This is seasonal and varies. Confirm locally. 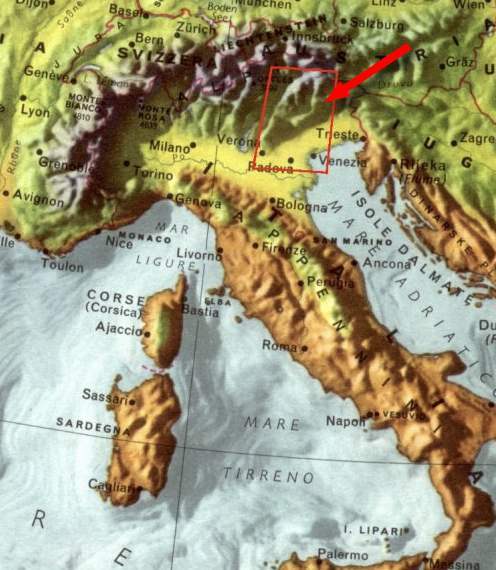 This page says that Marmolada is (only) 2996 m.
It’s a lot higher than that. Google it! Thanks. I’ve updated our page. Hello! Can you tell me from what trail the above picture was taken? Thank you! Both photos look like they were taken near the Tre Cime di Lavaredo / Drei Zinnen (basically the “Half Dome” of the Dolomites), with Rifugio Aruonzo (http://www.rifugioauronzo.it) being the one you can drive right up to to start hiking around the formation (a good 3 hours). The Drei Zinnen Hutte / Rifugio Locatelli (http://www.dreizinnenhuette.com/) is a solid 1 hour hike from Auronzo and has the best view of the peaks though, as well as a short 2 min walk to begin the Via Ferrata course and explore the WWI caves on Mt. Paterno / Paternokofel. I will be in Italy next week and am looking for one 5-6 hour hike for Thursday and a 2-3 hour hike for Friday morning. We are renting a car so we have some flexibility. What recommendations do you have? Could you please tell me the starting and ending points of some hikes? Wondering if anyone could help, not finding much information on weather conditions around the the different areas for December time? My husband and I are going to be in the area in late November and have the same question that you had about the weather conditions. Did you complete your hike in December? Can you share anything about the weather you experienced? Hi Samantha. I’m here in the Dolomites right now, and it’s getting pretty chilly! I’m considering going lower and south for warmer weather. Shorter days, cold, and rain/snow make it tough going. But I’m also from sunny California, so I’m a bit of a wimp in cold weather. I wonder how many huts would be open in late November? I would Google some tourist information centers and ask them. Most speak good English. Wondering if there is an alternative route from Rifugio Pian de Fontana to Belluno without climbing at Rifugio 7 ° Alpini. Thanks! Hello. I’m planning on three nights in the region and trying to decide the best city for base camp. I’d like to head out for day hikes that are high and rewarding. Moderately difficult is fine. I’ll be there early September. If anyone has any advice, I’d be so grateful! Thank you!! Hi, just came back from 5 days hiking in the Alta Badia region. La Villa is a really good base camp with several day hikes next door. You can buy a lift/bus pass in the village and use all the lifts in the region. I recommend the day hike to Puez Hut (take lift to Gardenaccia from La Villa)/ Another nice but more challenging walk is the one to Fanes hut from Heiligkreuz in Badia. A more easy walk but with the best views is the walk from Piz La Ila (lift from La Villa). Thanks for the tip, Koen. This is very helpful, Koen. I really appreciate you writing! I’ll start investigating now. Take care! I was trying to look into the hike from Heiligkreuz to the Fanes hut and would only find trail #7 which was an advanced via ferrata. That the challenging walk you did? I’m looking to get from Badia to the Fanes hut without taking a via Ferrata. wondering if you have any tips? on where to go where to stay ? Thanks for sharing this one, very useful post. We’re going to spend winter and summer holidays in Dolomites in 2016 so every information is welcome 🙂 Did you do any via ferrata rails? I did very little via ferrata myself. But certainly plan to get back for a via ferrata holiday. Hi, I plan to go this December. Can you suggest some ferratas which will be open please? Hi! My partner and I are hoping to head to the Dolomites at the beginning of June for a week or so. Any info re best place to base ourselves and good walks would be much appreciated. Do we need to book before we get there? Hello. I’m planning on two nights in the region and trying to decide the best city for base camp. I’d like to head out for day hikes that are high and rewarding. Moderately difficult is fine. I’ll be there 28 may to 30 may If anyone has any advice (are trails still covered with snow at this time of the year? should I change my route to toscana because of weather?- I prefer hiking), I’d be so gratefu for your advice! Hello! Planning a trip to the Dolomites this September with a 1,7 year old toddler. Could you recommend any easy tracks to hike with a child? :) Thanks! Hi, I’m traveling with family in May. Our first trip to the Dolomites. I know this is a hiking blog but I have a couple questions regarding wheelchair accessibility in the Dolomites: First, I am wondering how challenging the path is from the cable car Lagazuoi to the Rifugio Lagazuoi in terms of degree of steepness and length. My husband is a strong wheelchair user and I can help push at times, but would love to have a better understanding of this path. I really want to get him up into the Dolomites and this seems like the best way. Also, are there any other wheelchair accessible paths, even at the foot of the mountains that he can enjoy? Thanks for any help anyone can provide. Tom, I walked the Alta Via 2 with my wife and daughter in 2015 and, as it is so awesome, again last year in 2017 with a workmate. Last year we joined a fun bunch of 50-60yr American women along the way. You don’t require any pull-ups on the hikes. Use walking poles and stiff soled but light weight boots and almost anyone with some hiking experience can enjoy these trails. If you are not great with exposure then Via ferrata gear is good to have, but you don’t really require a helmet, just a light harness and leash. Cycling gloves are the best to hold the cold cables.